A couple of years ago a new Swedish AOR band Diamond Dawn released their rather good debut album ”Overdrive”. The band could have been called Diamond Dusk just as well, as their story ended later that year. 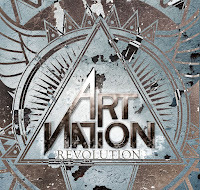 Two new bands were born out of this ”separation”, and Art Nation is the one that features the former Diamond Dawn lead vocalist Alexander Strandell. The other band is called Streamline and they are also working on new material. If you liked Diamond Dawn, you’ll probably like Art Nation too. There hasn’t been a drastic change in the music style even though some of the songwriters may have changed. Art Nation still play melodic, hook-driven rock with big keys, guitars and vocals and they do it well. ”Revolution” might not actually offer anything revolutionary to the melodic rock genre, but I think it’s better than ”Overdrive” and most probably one of the best Scandi-AOR albums you’ll hear this year. Yes, at times the band does sound a lot like H.E.A.T., but I could think of much worse musical crimes they could have committed. The positively enormous opener ”Need You To Understand” sets the pace for the rest of the album. Guitarists Christoffer Borg and Johan Gustavsson throw in some wicked shredding and Strandell adds some spectacular vocal acrobatics to the song, which itself boasts one of the biggest choruses I’ve heard lately. Other highlights include ”3000 Beats”, ”Down Wait For Salvation”, ”Here I Am”, ”All In”… plenty of good stuff. Okay, the bluesy ”Wage War Against The World” sounds like it could’ve been taken from the latest couple of Europe albums and doesn’t really appeal to me, and I haven’t warmed up to the ballad ”Look To The Sky” or the Hammond-driven rocker ”I Want Out”, but the remaining tracks are all top-notch. Except for the intro of ”Start A Fire”, which sounds like a computer alert or an ancient phone ringtone!